The Global Maker Challenge is an online open-innovation platform that offers an opportunity for ‘makers’ and innovators to connect and collaborate, wherever they are in the world, to solve real-world problems affecting people’s lives. Leveraging manufacturing innovation to provide viable and deployable solutions for the world’s most pressing issues, it invites world-leading manufacturers and organisations to adopt challenges, provide mentorship, and help solve real-world problems. To get more exciting opportunities like this, at your fingertips, install the Youth Opportunities Mobile App here. The Global Maker Challenge is one of two programs facilitated through the Mohammed Bin Rashid Initiative for Global Prosperity. The Initiative was launched by His Highness Sheikh Mohamed bin Zayed Al-Nahyan, Crown Prince of Abu Dhabi and Deputy Supreme Commander of the UAE Armed Forces, in honor of His Highness Sheikh Mohammed bin Rashid Al-Maktoum, Vice President and Prime Minister of the United Arab Emirates, Ruler of Dubai, for his commitment in transforming the United Arab Emirates. These organisations have developed four themes surrounding major challenges faced by the least developed and developing countries. Massachusetts Institute of Technology (MIT) Solve is working with the Mohammed bin Rashid Initiative for Global Prosperity to bring together problem-solvers and innovators to work with stakeholders and technical experts to design and manage each challenge. The Global Makers Challenge invites innovative start-ups, entrepreneurs and businesses to submit solutions to solve real-world problems. The challenge is vertically divided into 4 themes, Sustainable Energy, Digital Divide and Digital Literacy, Rural Transformation and Zero Hunger and Sustainable Cities. Applicants are invited to enter their solutions to the challenges through our easy online application process. The four Challenge Winners will gain valuable recognition, global exposure, and mentor-ship if successful. 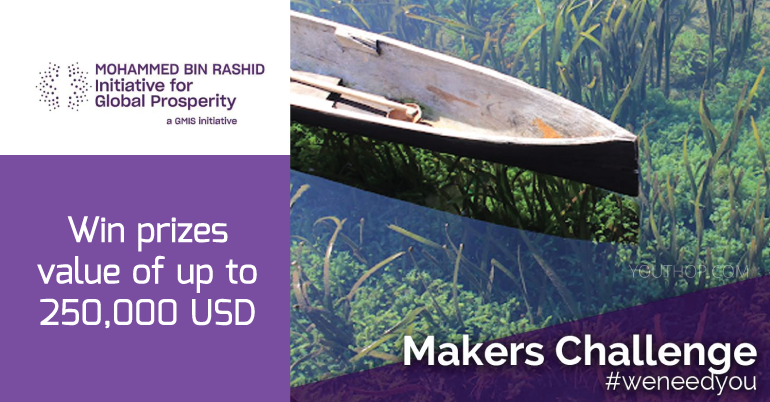 The Global Maker Challenge will award winners with prizes of value up to USD 1,000,000 in prizes. Within the four themes they are looking for solutions to solve real world problems identified as priority topics by MIT Solve in collaboration with various UN Agencies and Funds. Alignment: The solution addresses the challenge that has been set forth. Potential for Impact: The planned implementation of the solution has the potential to impact lives. Feasibility: It is feasible to implement the solution, and the team has a plan for the solution to sustain itself financially. Scalability: The solution can be grown and scaled to affect the lives of more people. Innovative Approach: This is a new technology, a new application of a technology, a new business model, or a new process for solving the challenge. Each of the 4 Challenge Winners can win prizes to the value of up to 250,000 USD, including cash prices and mentor-ship. The shortlisted companies will be invited to a pitch live session in UAE, and the finalist to the Global Manufacturing and Industrialization Summit, in July 2019 in Yekaterinburg, Russia. All flight and accommodation costs if any for shortlisted companies to participate to the pitching session as well as finalists for the award ceremony will be covered by MBR Initiative for Global Prosperity. Applications to the MBR Global Makers Challenge is open to all business model stages. It is open to any start-up, innovator or business that has a proof of concept and prototype for a viable, technically feasible and desirable solution that promises a strong impact on the identified challenge. Email organizers through official website.